An average of 10 people drown each day in the U.S., according to the American Red Cross. Eighty percent are adults. Drowning is the No. 1 cause of death for children younger than 5. If your family plans to spend much time in the water this summer, take advantage of the many free or inexpensive water-safety aids. Print out the U.S. Consumer Product Safety Commission’s Pool Safety Pledge at poolsafely.gov/pledge. Children pledge to never swim alone, to ask for swimming lessons, to stay away from pool and spa drains and to be safe. Adults pledge to designate “water watchers,” make sure their children can swim, learn CPR and make their pools safe. Search the Internet for “water watcher card” for a downloadable tag you wear, then pass to another adult when you delegate responsibility of watching others in the pool or at the beach, instead of casually telling them you are leaving. Always swim with a buddy; do not allow anyone to swim alone. Even at a public pool or a lifeguarded beach, use the buddy system! Ensure that everyone in the family learns to swim well. Enroll in age-appropriate Red Cross water orientation and Learn-to-Swim courses. Even if you do not plan on swimming, be cautious around natural bodies of water including ocean shoreline, rivers and lakes. Cold temperatures, currents and underwater hazards can make a fall into these bodies of water dangerous. Install and use barriers around your home pool or hot tub. Safety covers and pool alarms should be added as additional layers of protection. Ensure that pool barriers enclose the entire pool area, are at least 4-feet high with gates that are self-closing, self-latching and open outward, and away from the pool. The latch should be high enough to be out of a small child’s reach. If you have an above-ground or inflatable pool, remove access ladders and secure the safety cover whenever the pool is not in use. Remove any structures that provide access to the pool, such as outdoor furniture, climbable trees, decorative walls and playground equipment. Keep toys that are not in use away from the pool and out of sight. Toys can attract young children to the pool. 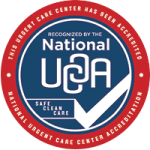 For more information, visit Advanced Urgent Care in Brighton, CO or call 303-659-9700.